This article about the surviving Wizard of Oz Munchkins led me to this Wikipedia entry on The Doll Family. The Dolls were four out of a family of seven children (the rest being of average size) born to Emma and Gustav Schneider in Stolpen, Germany. Harry and Grace were the first of the quartet to begin performing in sideshows, as "Hans and Gretel". In 1914 they were seen by an American, Bert W. Earles, who brought them to the United States to tour with the 101 Ranch Wild West Show. The siblings lived in Pasadena, California, with the Earles family. Earles also brought Daisy and Tiny to the United States (in 1922 and 1926 respectively) where they joined Harry and Grace in their act. 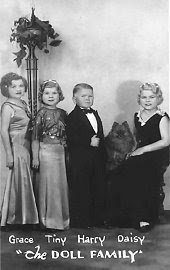 By this time, the entire family had adopted the Earles' surname; they would retain that name until Mr. Earles died during the 1930s, when the tiny performers became the Dolls - a name which reflected comments overheard from their audiences. What inaccuracies and glaring omissions can you find in this passage? The Pasadena household of Bertw Earles in the 1920 Census doesn't show a Harry or Grace living with them, but Kurt and Frida SCHNIDER are there. Occupation dancers in the circus; relationship to head of household is given as "Midget", so this is the correct household. Census information indicates the pair were born in Germany, and came to the States in 1914. The 1930 Census records Amelia/Emelia Earles as head of the household, with Grace, Harry, Daisy and Ellie residents in the household. They are recorded with the last name of Earles, and are noted as lodgers. Amelia's occupation is given as "theatrical manager," Harry is an actor with the "moving pictures"; Grace, Daisy and Ellie are noted as actresses with the circus. I don't see any comments on obtaining citizenship-- this site Doll Family has several pages of photos of the family. The newspaper clipping on this particular page of the site is from May 1921, and notes that they were recently naturalized. This article from the New York Times notes that they've recently applied for citizenship, records Friede and Kurt as married, but says they're "like brother and sister." Find A Grave notes that Grace was originally known as Frieda; Daisy is noted as "Hilda E." and Tiny is listed as "Elly." This same site also notes that after working in films, the family toured with Ringling Bros. circus during the '30s and retired to Florida in the '50s. At their deaths, all four were cremated; Grace's ashes are interred at Sarasota Memorial Park, FL; Harry's were scattered at sea; the location of Daisy's are recorded as "not known," The site notes that Tiny died "recently" but gives no specifics. On board the Kaiserin Auguste Victoria on May 2 1914 are Hermann Hornbogen, his nephew Kurt Schneider, niece Frieda Schneider, and cousin Amalie Schulte. The occupation of the two Schneiders is “Zwerg” which means dwarf. Herman is 5’ 8”, Kurt is “90 cent.” and Frieda is “95 cms,” and Amelia is “1m 96cm” which is 6’ 4”. Her occupation is “Riesin” or giantess. They are on their way to Coney Island showplace. I cannot make out Hermann’s occupation but on his Chicago WWI draft card he says he is an unemployed circus performer with no relatives in America. Amalie Schulte, whose brother is living with her in 1930, married Bert Earles sometime before 1921 when she is arriving in NY from Rotterdam on the Rijndam. A 1925 passenger list for the Olympic records Bert W Earles and Mrs. Amalie Earles arriving in New York. On the same ship is a German citizen, Ellie Schneider from Stolpen, on her way to Illinois. The 9 Feb 1930 LA Times states that Bert Wilbert Earles of 4901 Pasadena Avenue, husband of Amelia Earles, died February 5. I believe that Hermann's occupation was "Impresario," suggesting that he was the siblings' manager as well as their uncle. It does appear that Bert W. Earles had a family connection to the Dolls through his wife: he was their first-cousin-once-removed-in-law, or something like that. Amalie Schulte was born in Wuppertal, Germany, and had a daughter Wally Schulte. My Grandmother. I would like to know more about her life! Amalie Schulte was also called The German Beauty, Riesin Raja, Riesin Raya and Sonja, because her lovely curves and very cut face. Her real name was Amalie Schulte. She was born in Wuppertal, Germany. She toured with Barnum & Bailey Circus in 1914 . She was listed at 7 feet 2 inches (218.4 cm) and 7 feet 0.3 inches (214 cm) but she was probably a quite bit shorter, as 6ft4. (It wasn't uncommon in those days for very tall women who were touring as giantesses to wear long robes and high heels). She had 2 daughters . A 1925 passenger list for the Olympic records German citizens Bert W Earles and Mrs. Amalie Earles arriving in New York, from Hamburg. On the same ship. The 1930 Census records Amelia/Emelia Earles as head of the household, with dwarfs Grace, Harry, Daisy and Ellie residents in the household, recorded with the last name of Earles, and are noted as lodgers. Amelia's occupation is given as "theatrical manager. Her brother (or daughter) is living with her in 1930.